Traditionally, rituals have not only been for holidays or personal practice. They also mark milestones in life, when something major is occurring and the community wants to acknowledge that change. Naming ceremonies, passages into adulthood, weddings, and funerals are all examples of rites of passage. This is a tradition that appears to go back a long way. There is a Paleolithic cave in France which preserves the footprints of children dancing in a circle, and it is possible that this evidence, plus the hundreds of hand prints—each of a different person—found on the walls of many of these caves marks the traces of truly ancient passage rites. In such caves, the farthest and most difficult to reach areas sometimes contain art of part-human, part-animal creatures: most likely the “revelation” reached at the end of a ritual ordeal. Mainstream culture pretty commonly celebrates only three forms of rites of passage: Naming ceremonies for babies (“Christening” or baptism, for Christians), weddings, and funerals. But arrival in adulthood (whether legally or biologically) is one we really should mark, as it helps young adults to know that they have new responsibilities and freedoms, and moving on from adulthood into elderhood is one we should consider, as well. Atheopagans, too, can implement rites of passage into our practices. All of us are born and die. Most of us, too, get married and/or have children, grow into adulthood, and age. Rituals with our families and community to acknowledge these milestones can lend meaning and richness to the process of our living. It is the “ageing” part of the arc of life that may be hardest for us to acknowledge. The cult of youth is so pervasive and powerful (in American society, anyway) that few of us acknowledge a point when we have become elders, preferring to persist in self-identification as “youthful”, if not exactly young. But there is a value, I think, in acknowledging that we have arrived at a Certain Age. It may be easier for those with uteri to mark a definite point of change at menopause, but for those with testes, too, there are definite physical signs: onset of male-pattern balding, perhaps, or the beginning of accumulation of belly fat. That said, we are living so much longer lives now than did many of our ancestors that the point of declaring yourself “old” may be deferred for awhile. For myself, I have decided that 60—presuming I get there— will be the age at which I declare myself “old” (though I intend to be a vigorous “old”). I’ll hold a special birthday party that year with a ritual marking my passage into elderhood. For those of you planning or officiating at a rite of passage, remember to consider what the meaning of the transition is to the subject: is it arrival in the magnificent Universe, or in the sovereignty of adulthood? Is it the commitment of marriage (be it for some limited period such as “a year and a day” of “handfasting” (a Pagan term for marriage), or until such time as love no longer thrives)? Each rite of passage—even a funeral—is a celebration, even if there is loss sown into it. What are you celebrating, and how can that joy be brought out into the community of your friends and family? Depending on where you live, legal requirements for conducting weddings will vary. You may need to partner up with someone from a legally recognized religious organization in order to conduct this important rite of passage. Speaking of which, divorces are important life passages, too. I’ve been to a couple of divorce rituals (including one of my own): they were beautiful and heartbreaking. In each case, as you frame a rite of passage, be thinking about what the multiple meanings are for that passage. Life is complex, and no phase of it is just one thing. Particularly, be careful about assumptions about what the next phase of the person’s life is likely to be about, because frankly, you don’t know. Some people undergo gender transitions. Some people have children, others don’t. In all cases, a rite of passage should be affirming, describing the new phase as a positive step forward (or, in the case of a funeral rite, describing the life of the deceased in positive terms). Our lives are precious, and a central element of Atheopaganism is about not letting them slip by unnoticed. Mark those important transitions for yourself and your friends! You’ll be glad you did. 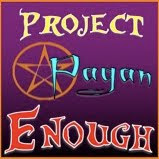 It’s a sadly familiar tale in the Pagan community: the coven or local organization that is run by a charismatic “high priestess” or “high priest” (or both), doling out “training” and “degrees of advancement” based on how well the subject toes the line, fawns over the “priest/ess”, and, in some particularly sad cases, provides them with sexual favors as a part of the “initiatory process”. Or…the narcissistic Pagan “leader” who works to cultivate a young and pretty entourage of on-tap adorers as a part of imparting their “wisdom” to followers…and for whom those not so young or pretty never quite seem to make the grade for advancement. Or…the dirty secret that eventually comes out about some bright and innocent aspiring newby who ends up being harassed until driven away by such a “leader”. But wait…isn’t that essentially the sad and common story in pretty much every religious community? I’ll cut to the chase: that entire model—of heirarchy in power, respect and even obedience in spiritual community—is rotten to its core. It is a guaranteed formula for abuse. It is the same as when bosses have power over employees, when teachers have power over students, and when adults have power over children. And while those power gradients may be inevitable, we don’t have to have them in religion. We see it in the Christians, we see it in the Buddhists, we see it in the Pagans. Doesn’t matter the cosmology and practice. Having some people who are considered “more advanced and important” in a religious context just doesn’t keep people safe. I don’t know how many times I have heard from bright, creative, interesting, wise people that they gave up on their local Pagan community because of some would-be guru abusing the trust that others placed in them: socially, financially, sexually. I’ve seen it myself, close up. And as far as I’m concerned, in Atheopaganism we ain’t doing that. Yes, I’m the primary voice here at the blog (which reminds me: I welcome guest posts! Please send me your submissions!) And mine is the name most associated with this path, because I started it and I’m devoting a significant chunk of my life to helping to build and raise the visibility of its vision and practices. But I am NOT the high priest of the Atheopagans. We have no clergy, no advancement levels. I’m just a guy with ideas who cares, devoting what skills and wisdom he has to making a path. Others seem to find it valuable, and that’s really gratifying to me: it makes me feel committed to this community, to feel love and inspiration that these ideas and practices are of value in the lives of others. YOU, fellow Atheopagan reading this, are the “high priest/ess” of your life. You are the ultimate moral authority in relation to you. Given learning of ritual skills and a desire to do so, you can be the leader of a ritual just as well as anyone. And you have as much standing to contribute lore, philosophy, and suggested practices to Atheopaganism as anyone else. If you find something in what I write objectionable, I hope you will say so, directly to me. Let’s talk about it. Maybe I got something wrong, or have a blind spot. Or maybe you just have a better idea for how to handle a particular situation or ritual technique. Bring it forth! We are collaborating in building this path together. Some of the stories that have come forward in the wake of the abuse accusation against Isaac Bonewits on Facebook and in comment threads have nearly brought me to tears, because they are from good people who were driven out of Pagan community by the sheer dysfunction of those who claimed to be its leading exponents. I’ve seen it myself, in the Church of All Worlds, where grounded and sensible and functional people would come in, look around, and run screaming…but crazy and creepy settled in and stayed for years. One of the truly wonderful things about creating a new tradition is that we can learn from the mistakes of those who have gone before us. And in Atheopaganism, I’m doing my best not to introduce any element that can be distorted or abused to enable the kinds of shenanigans described above. There is an anarchist slogan: No gods. No masters. This has been adapted by some theistic Pagans to Many gods. No masters. Well, I’m here to tell you, folks, if you have a priesthood standing at a level between you and your gods—if you really think that someone who calls themselves a “priestess of Goddess X” has a closer relationship with that aspect of the Sacred than you do—you’ve got masters, whether you want them or not. And some of them will inevitably betray you. So I say No gods. No masters. No priests. No priestesses. Just we critters, equal and humble under the gaze of the Sun, working together to make our way. 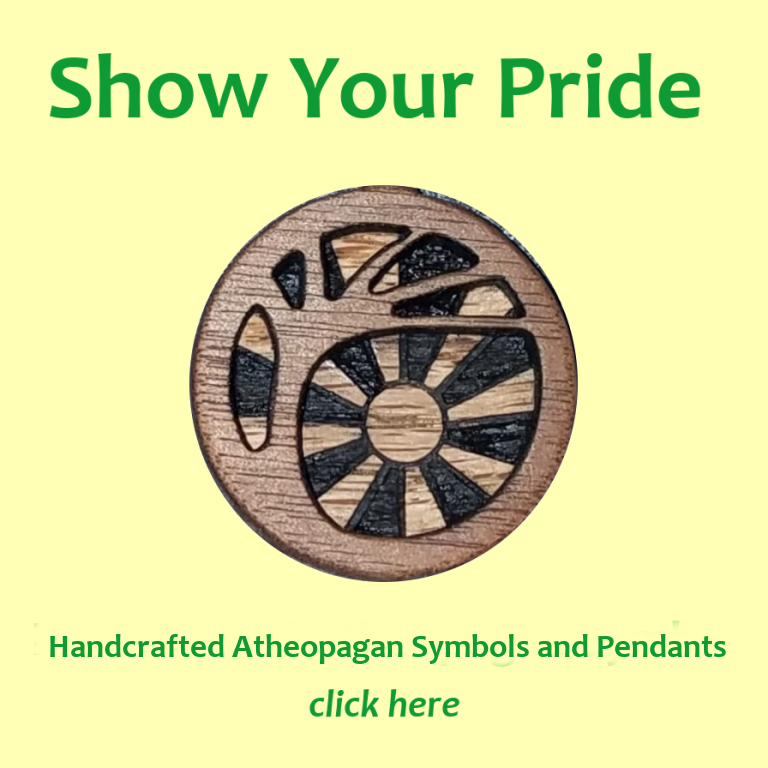 If you come to Atheopaganism from other Pagan paths, you may have noticed something in my writing, at least: there is no mention of priesthood or priestesshood. Rituals very often have leaders. There is usually one person (sometimes two, but rarely more except with very large groups) who shepherds the flow of the ritual through its phases. This is inevitable and proper: leadership is a real function and all human groups have examples of how it is exercised, even in groups with completely flat power structures. Leading a successful ritual—helping to “move the energy” or facilitate the smooth building of emotion and Presence—is a learned skill, and a powerful one: it translates to the ability to lead in many other life contexts. It’s a valuable thing to be able to do. So my hope is for all who wish to do so to learn it. This requires that we practice, and pay attention to how various techniques work out in our rituals. 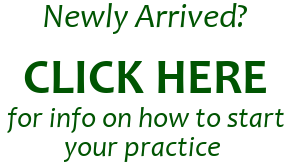 It also requires that those of us who are experienced in leading rituals make room for those who are new and learning. I thought about using the term “priest/ess” as a verb, as in “priesting the ritual”. Many do in Pagan circles. And I might yet, in the future. There is power in the term, and in carrying it, as I have done many times in leading Pagan rituals. But there is something about the word that necessarily implies division: there is a Priestess, and then there is everyone else. And I really hope for Atheopaganism to be a path within which we are all working together to lift one another up; in which we are all both priesthood and congregation, equal though different, and each empowered to create and lead both working ritual circles (covens) and rituals as we see fit to do and as we understand ourselves capable of doing. This is a new path. 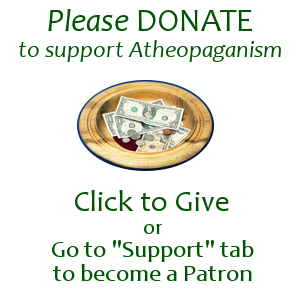 It’s similar to some other naturalistic Pagan paths that have been charted before, but it’s somewhat different as well: Atheopaganism is focused on practice more than ideology, and it presents a ritual structure that is different from the standard Wiccan model. As it grows—presuming it continues to do so—I hope that everyone investigating it feels empowered to both tinker to make it fit her personally, and to take the lead in making ritual celebrations happen. We’re all Priestesses and Priests of Atheopaganism, should we choose to deem ourselves such. We all have within us what it takes to convene others of like mind and to move through the paces of ritual observance in a manner that is effective, should we so choose…or the ability to develop such skills, if they are not already present.